BUCYRUS — The Crawford Soil and Water Conservation District (SWCD) recently had its 72nd annual meeting, in combination with the Crawford County Farm Bureau’s annual meeting. One of the main events at the meeting is the SWCD special board of supervisor’s election. Congratulations to Larry Leonhardt and Adam Spiegel, who were elected to the Crawford SWCD Board of Supervisors for three-year terms beginning Jan. 1, 2018. The Crawford SWCD is a looking for conservation leaders to fill this important role. Contact the SWCD office at 419-562-8280, ext. 3 for information on becoming a candidate. 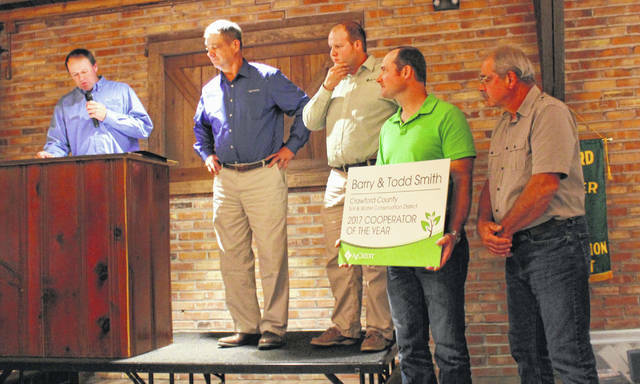 This year’s outstanding cooperator award, sponsored by Ag Credit, went to Barry and Todd Smith. They began working with the District in 2012. They first used grant cost share to plant 40 acres of cover crops that first year along with a conservation plan that includes nutrient management, woodland management and pest management. They also adopted drainage water management, grid soil sampling and variable rate nutrient applications the following years. They continued utilizing cover crops with assistance from the USDA Environmental Quality Incentive Program, and the Lake Erie Nutrient Reduction Project phase two grant. They have adopted minimum and no-till conservation cropping rotations along with grass waterways and maintain buffer strips on their own. All of these conservation practices help the district achieve the goals of the Lake Erie Nutrient Reduction Demonstration Project on the Loss Creek and Allen Run watersheds. Special recognition was given to 42 affiliate members who assisted the district by donating almost $4,798 to 2018 programs. Past supervisor Kent Stuckey was recognized for his 20 years of service and Andrew Eichhorn for 13½ months of service. The board and staff thanked volunteers who have helped make SWCD programs successful. They also congratulated individuals who cooperated with the districtin the last 72 years by putting important conservation practices on the land, realizing that our current generation must continue to work to protect all of our natural resources for future generations!